Experience the rare opportunity to join in the harvest of 6-year old ginseng roots for yourself which you can bring it home — for free! Ginseng is world-known as the metaphorical "elixir of life." The Seosan City government in Chungcheongnam-do is now galvanizing a grand fair dubbed as the "International Festival for Seosan's 6-Year-Old Ginseng Roots" which seeks to showcase the country's secret of long-lasting vigor and vitality which can be found in the roots. The tour is scheduled to be held on October 9 this year from 10 a.m. to 4 p.m.
Diplomats, embassy staffs and their families, and about 400 expatriates are the target participants to join in this event. A free tourist bus will be provided from Seoul to take them to a 2-hour trip to Seosan's Ginseng Cultivation Farm. Participants will be toured around the plantation under cultivation comprising of a sprawling 129 hectares with 260 farms yielding a total annual production of 122 tons. All invitees and accompanying members will be allocated a 3 sq.meters family plot each in the field for individual harvesting and collection of ginseng roots grown for six years. They will also be taken to a city tour, including the famous and historical sites in and around Seosan. Additional feature of event will give the city mayor an opportunity to present the development and economic plan for Seosan ginseng which will include discussion and planning for the Seosan 6-year ginseng as a global brand name. 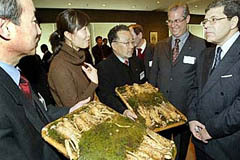 Seosan ginseng has unique qualities attributed to the area's topography appropriate for growing ginseng. Ginseng from this area has proven to be a panacea to almost all kinds of diseases. Apart from prolonging vigor and vitality, it also prevents lethargy and depression. It cures anemia, low blood pressure, weak heart conditions, neurosis and nervous breakdown, diabetes, gastro enteric troubles, loose bowel movement, constipation and lack of appetite. It is effective against tuberculosis, asthma, skin swellings, boils, tumor, abscess, and it is also known to make the skin smoother. The event is sponsored by The Seoul Times. Interested participants may call the event management agent, Global Korea Co., Ltd. At tel. (82-2) 445-8300; Mobile: (82) 16-9885-2000; or visit: www.globalkorea.info.